VMware, a US-based company that leads the world in virtualization and cloud-computing software, has partnered with South Korean telecommunications firm KT as part of efforts to address growing demand among client companies for “hybrid clouds,” or a multi-cloud environment. VMware announced Tuesday that it plans to launch a computing solution called “VMware on KT Cloud” in Korea within this month. It will make VMware’s solutions compatible with KT’s public cloud services. The collaborative solution will enable client companies to smoothly operate a “hybrid-cloud” setting, in which data can be seamlessly transferred from private clouds running on a firm’s on-premises data center and public clouds provided by third-party players like Amazon Web Services or Microsoft Azure. KT is one of VMware’s local partners in Korea. In an age of “hybrid clouds,” VMware believes it can provide efficient back-end software that lets clients move their locally stored data from a private cloud to a public cloud and vice versa without encountering complex configurations or security issues. “Going beyond private and public clouds, ‘multi-clouds’ are becoming a new competitive edge for businesses around the world,” Jun In-ho, managing director of VMware Korea, said during a press conference held on the sidelines of vFORUM 2018 in Seoul, an annual enterprise software industry conference hosted by VMware. “Without strong digital infrastructure (achieved in part by adopting hybrid-cloud systems), it will become difficult to quickly deploy and operate services and apps demanded by the market,” he added. 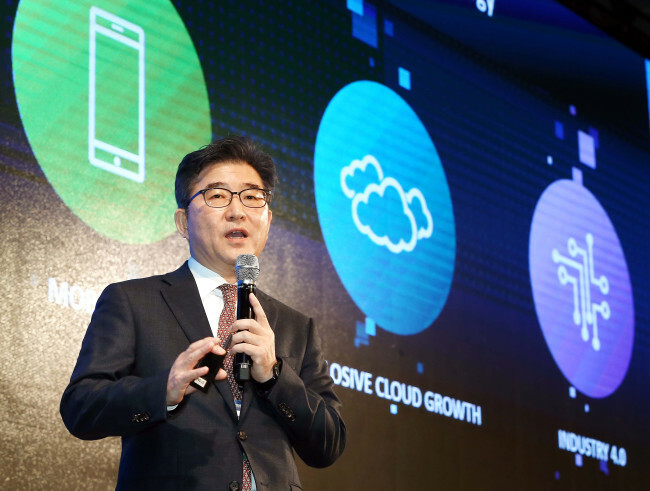 The VMware Korea chief pledged to work with KT to provide stronger cloud solutions to Korean businesses, particularly clients that already use VMware solutions and desire greater flexibility to expand their cloud infrastructure. Since entering the Korean market in 2005, Dell Technologies subsidiary VMware has been working with clients including Samsung, Hyundai, Posco, LG, SK, GS, Kolon and Shinhan Bank to build enterprise IT infrastructure, including private clouds. As more firms adopt public clouds -- from which computing space can be rented as needed on a pay-per-use basis, offering increased flexibility and cost-efficiency -- VMware believes it can act as a “bridge” that helps clients make this transition. Migrating data and apps stored on a private cloud to a public cloud and vice versa requires reinstallation and reconfiguration of the apps, a process that can be time-consuming and error-prone. To circumvent the problem, VMware uses a so-called virtual “filter” that eliminates the need for any modifications, enabling a seamless transition between private and public cloud systems, it said. By doing this VMware hopes that client enterprises, whose IT infrastructures already employ many VMware solutions, will remain within the VMware ecosystem even as they choose to reduce their dependence on private clouds and embrace public clouds.